Along with being a premier manufacturer of speciality aggregates, Kafka Granite has the unique trait of being the exclusive Midwest distributor of a variety of other architectural products. Covering the spectrum from stacked stone to reclaimed wood, Kafka has creative and beautiful solutions to interior and exterior needs by being able to offer both Norstone natural stone veneers. The variety of looks and impressions Norstone lend to most spaces is unmatched. 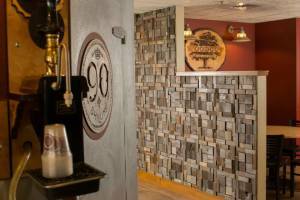 Norstone offers stacked stone and ledgestone panels, as well as undeniably modern Lynia Interlocking Tiles. Simple and cost-effective, both options are all-natural and easy-to-install. Both the Rock Panels and Lynia IL Tiles are installed similarly to any mat-mounted tile product while remaining low-maintenance throughout their life. Norstone Rock Panels and Lynia IL Tiles can be used in both exterior and interior applications. The design aspirations, however, are boundless. Both commercial and residential spaces make fitting arenas for the variety, customization and visual appeal of both products and their unique aesthetic offerings. 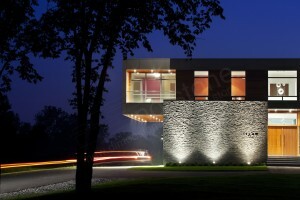 Kafka Granite exclusively distributes Norstone throughout the Midwest. For samples, quotes or to discuss any project that could be enhanced with natural wood tiles, stone veneers or ledgestone panels, please contact us today. Kafka Granite’s Burma Red Stabilized Infield and Warning Track Mixes are made of a premier blend of our decomposed granite-based infield or warning track mix and a natural stabilizing binder by Stabilizer Solutions. To ensure that maximum stability, permeability and cohesion are achieved from this infield mix, proper installation is critical. One of the advantages of a decomposed granite-based ball yard mix is its ability to offer superior permeability due to its granular nature while staying compacted better than sand-, limestone- or clay-based infields. Appropriate preparation and installation of the infield or warning track mix and its base materials will help make any ball field safe and stable for all players while significantly minimizing maintenance for groundskeepers down the road. Measure and lay out infield or warning track. Per your specific field dimensions, measure where the infield or warning track will be laid. This includes marking where existing sprinklers are. Excavate. Once laying out the field is complete, it’s time to break ground. For the Burma Red Stabilized Infield or Warning Track Mix, make sure a minimum 3-inch depth is reached all around. Level native soil. Native soil, the soil that is native to the ground that was just excavated, is often an acceptable base for the Stabilized Infield or Warning Track Mix. However, if your native soil is sandy, you will have to bring in a different clay-based soil for a compacted base. After the base is laid, it should be leveled, preferably with a laser grader. Water and compact base layer. After the base layer has been leveled, water thoroughly. Allow the base to dry until damp. The base layer should not be muddy. Then, compact the native soil base using a one-ton drum roller. A plate compactor can be used, if necessary, in hard-to-reach areas. Spread Kafka’s Stabilized Infield or Warning Track Mix. Using a front-end loader, the loose material should be laid down to allow for a minimum 3-inch compacted depth. Note: The estimated coverage for Kafka Stabilized Infield Mix is 70-square-feet per ton for a 3-inch depth and 50-square-feet per ton for a 4-inch depth. Ensure the infield or warning track is sloped at ½%. A ½% slope of the infield or warning track allows water to drain laterally off the field, which further helps prevent flooding and delayed gameplay. Using a laser grader is preferred to ensure a consistent slope. Water newly laid infield or warning track. Thoroughly watering Kafka’s Burma Red Stabilized Infield or Warning Track Mix after it’s been laid and sloped will activate the stabilizing binder. It is always better to overwater the infield than not water it enough at this stage of installation. The field should be damp but not muddy. Compact infield track. Wait 24–48 hours after watering to compact the infield or warning track. The amount of wait time depends on the amount of water used and the local climate. As soon as the field allows, compact with a one-ton roller. Do not use a vibratory plate compactor or the vibratory setting on the roller, as the vibration may separate the stabilizing binder from the aggregate. Quality assurance and finishing touches. Check the field for low areas. If any exist, add infield or warning track mix as needed and compact. Repeat as necessary until all low areas are gone. Install base anchors and home plate, and get ready for a great season! If properly installed, Kafka’s Stabilized Infield or Warning Track Mix will provide a low-maintenance, environmentally friendly ball yard that offers the best permeability and stability around. Expect safer footing and consistent ball play all season long. Kafka Granite is perfecting the art of ball yard mixes. Offering Standard, Stabilized and Hilltopper varieties, Kafka understands the fluctuating needs of every ball field’s infield and warning track. 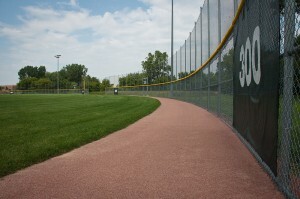 Comprised of decomposed granite, Kafka’s infield and warning track mixes offer a premium ball-playing experience. While most infields use a blend of sand, silt and clay, Kafka realizes the vast advantages of decomposed granite when it comes to player and fan experience. Whether it’s permeability of the infield or its ability to act consistently with hopping balls or skidding players, decomposed granite offers more than other typical infield mixes. There’s a fine balance when it comes to creating an infield that drains well, yet remains compact enough to provide a firm, stable playing surface. 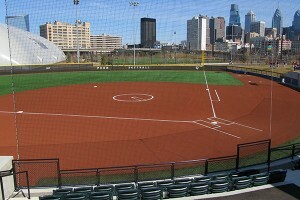 Kafka Granite utilizes a decomposed granite-based infield mix, which reacts better to rain and gameplay than merely compacted clay, sand, or limestone. Kafka Granite’s decomposed granite is crushed and screened to size and in some instances, pre-blended with either an organic stabilizing binder or an engineered wax polymer for the most cutting-edge technology in ball fields. Continue reading for a brief summary of our infield options and to learn what sets them apart from your everyday muddy and dusty fields. Kafka Granite’s Burma Red Standard Topdressing mix is a premium, yet cost-effective solution for existing infields. Only ¼” to ½” of depth is needed to cover existing infield material to provide the safe footing, smooth sliding and consistent ball hops known to come standard with Kafka infields. The Burma Red Stabilized Infield Mix combines the best of two worlds: Kafka’s decomposed granite infield mix with Stabilizer Solutions Organic Binder. 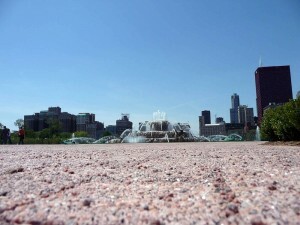 Stabilizer Solutions’ proprietary natural binder coupled with Kafka’s decomposed granite infield mix provides enhanced stability and footing with increased cohesion while maintaining permeability. 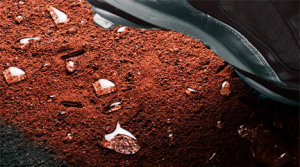 With the ability to hold 12 times its weight in water and release moisture when the infield runs dry, Burma Red Stabilized Infield Mix’s ideal moisture reduces mud and dust, provides preferred cushion and flexibility, and requires less maintenance and preparation — which means more time to play ball! Comprised of Kafka Granite’s Standard Burma Red Mix, the Burma Red Hilltopper Infield Mix also incorporates a water-shedding wax polymer proprietary to Stabilizer Solutions. The cutting edge of infield technology comes from Kafka Granite; the wax polymer combined with the tried-and-true decomposed granite infield mix makes it possible to continue gameplay minutes after a storm has passed, or even during the rain if you wish! As soon as the clouds roll out and the rain stops pouring, this infield mix provides players with a waterless, mudless and dustless playing surface while providing fans with less waiting and more gameplay. Every four years, America’s infrastructure is graded by the Advisory Council comprised of American Society of Civil Engineers members*. In 2013, the United States of America barely passed, earning an overall grade of D-plus. However, more and more businesses and initiatives have sprung up to try and resolve the deteriorating condition of America’s infrastructure, and Kafka Granite is with them in seeing opportunities to aid in raising our grade. The categories being routinely graded are public facilities, energy, water and environment, and transportation. By using a simplistic report card scale of A to F, grades are assigned based on eight criteria: capacity, condition, funding, future need, operation and maintenance, public safety, resilience and innovation. Kafka Granite offers products that could help improve the safety of dangerous overpasses, slippery bridges, failing roads and other types of surface transportation, which received an individual grade of D.
Within the ASCE’s 2013 Infrastructure Report card, it was determined that 32% of America’s major roadways are in poor to mediocre condition. As unpleasant as it is to drive on a roadway in poor or hazardous condition, it’s more unpleasant to address the surmounting costs incurred by motorists around the nation. When a road, whether it be a bridge, overpass, or an exit/entrance ramp, suffers from a loss of traction and surfaces become increasingly slippery and dangerous, the safety of motorists is compromised. Less-than-ideal conditions can range from roadways being poorly planned to being poorly maintained. The financial costs of U.S. motorists traveling on deficient pavement stood at a staggering $67 billion per year in 2013 while also costing many lives. In 2010, 32,885 motorists, nearly one-third of traffic fatalities, were a result of roadway deficiencies. The importance of a healthy infrastructure affects more than just motorists. 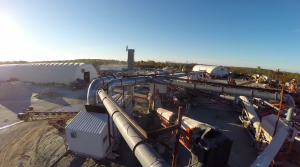 The following video summarizes the 2013 ASCE Report Card for America’s infrastructure and its value. Kafka Granite sees a way to construct safer surfaces and even improve the condition of diminishing and dangerous roadways: high-friction surfacing. High-friction, or non-skid, surfacing epoxy overlays can improve the safety of preexisting roadways as well as be used during new roadway construction to create a safe, high-traction, high-friction surface from day one. 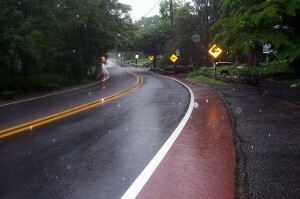 A slippery surface renders roads more dangerous, especially when these roads are heavily used. A high-friction epoxy overlay on a new or deteriorated roadway vastly increases traction between the road and vehicle, which could prove critical for accident-bound stretches of road such as bridges, overpasses and exit/entrance ramps. Recognizing that 47% of urban interstate VMT (vehicle miles traveled) are traveled over deficient pavement, Kafka sees potential for improved safety, cost savings and a higher ASCE grade for infrastructure on the next report card. High-friction epoxy overlays dramatically increase traction year-round and help motorists stay safe whether trekking across roads coated with rain, ice, or snow. High-friction surfacing aggregates are extremely hard and can endure rigorous environmental conditions, including harsh freezing and thawing cycles. These aggregates can be manufactured to meet Department of Transportation specifications and generally add 3/8” thickness to pre-existing roadways. Kafka Granite’s unique and vast aggregate color selection also makes it possible to enhance a roadway’s safety even more by being able to distinguish bike paths, street shoulders or crosswalks with colors that contrast against the street itself. It’s predicted that the financial needs to improve America’s surface transportation infrastructure won’t be met by 2020. With businesses like Kafka working to provide potentially more cost-effective solutions, roads across the nation can adopt solutions like these and become safer for motorists nationwide.